BUSH and STONE TEMPLE PILOTS Superpack Giveaway! What’s going on guys!? In honour of the “The Revolution 3” tour that ended on September 2nd in Phoenix, Arizona, we’re doing a Bush and Stone Temple Pilots superpack! Bush, The Cult and Stone Temple Pilots all went on tour this summer produced by Live Nation. A lucky winner of our contest will have a chance to win the Bush albums The Science of Things, Deconstructed, and Razorblade Suitcase, Stone Temple Pilot’s Core, along with a bonus album from Institute. Dean De Leo of Stone Temple Pilots said earlier in the year, “It is a great honour, and pleasure, to know we will be spending our summer vacation on the road with the gents from The Cult and Bush”. Take the chance to win these CDs and rock out! 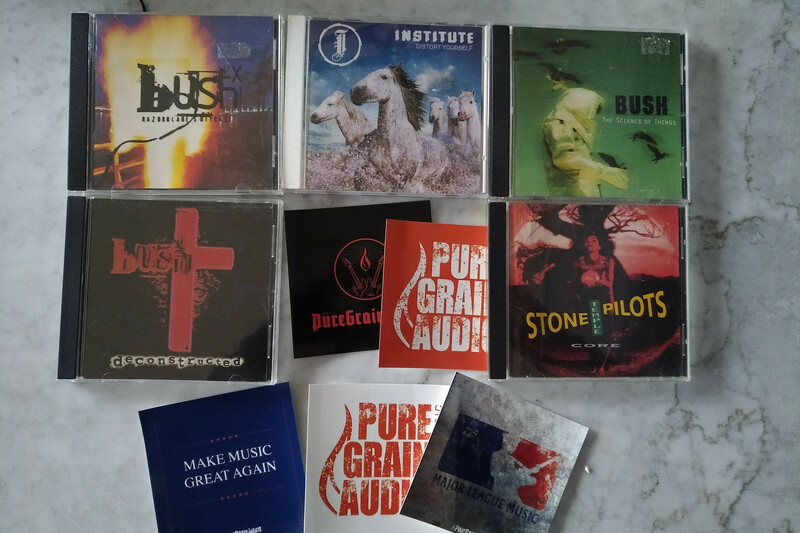 ONE (1) crazy fan will get the chance to win all five albums from Bush, Stone Temple Pilots, and Institute, plus a free PureGrainAudio sticker pack! Fill out the form below to enter and be sure to "Like" the PureGrainAudio Facebook page and share the post for extra chances to win! One of Bush’s mega tracks, give “Glycerine” a peek.